Did you know that 40% of paint purchases made are to correct a previous color mistakes? We’re frequently hired to help clients correct prior color mistakes, so we consider our PAINT COLOR CONSULTATION with an expert an affordable insurance plan. Not everyone needs an interior designer but selecting the right paint color requires thorough knowledge of the color wheel, pigment, light and undertones. So, our ‘ugly color prevention plan’ is one way to make sure that the paint colors you select will help you achieve the look you want. This one-time session prevents costly and time-consuming mistakes. Our goal is to help make this otherwise daunting task a fun and enjoyable experience for you. COLOR. It’s one of the most important elements of design. 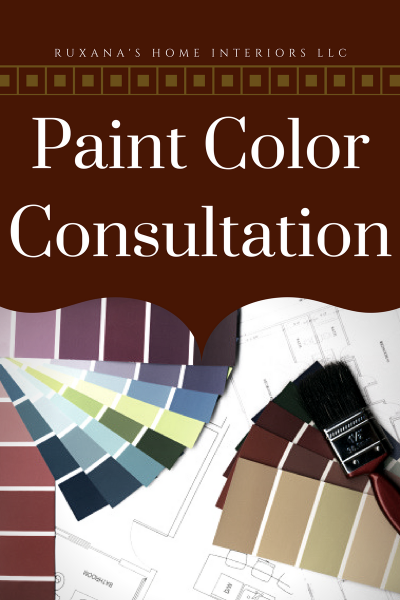 It can be an overwhelming and frustrating experience to select paint colors. How you use your space is an important element in the selection of color, so we will spend time during our consultation to determine not only how you use the space, but the existing décor, the room’s style, the mood you want to create, and the available light sources. Then we will recommend colors which will harmoniously blend all these elements together by considering paint, flooring, fabrics, tiles, textures, and their use in each room. There’s more to selecting the right paint than most people realize. Is the off-white you choose going to be a little too pink? Or too green? What about the beige….. is it too yellow? What if your red accent wall turns out to look like it belongs in a circus fun house? What color should the ceiling be? What about the window trim and baseboards? What about the crown molding? What should the finish be (flat, eggshell, low sheen/satin, semi-gloss, or gloss)? Interior and exterior consultations available. “You walked into my home and immediately made me feel comfortable with your suggestions and expertise. I had never worked with a designer before, and never really wanted to because I assumed that only people with a large budget used them. I would use you again in a minute. You were affordable and very easy to work with. Choosing paint and narrowing it down to a few great options was fun. I love the colors! Everyone, without exception, has commented on how great it looks.” Chris H.